Much has been written about otidias with sharply reflexed petals and downward-facing buds and stamens, following the research by Albers and Becker published in the late 2000s. To successfully identify an Otidia taxon, it has become fairly obvious that a combination of vegetative characters is needed, such as presence/absence of tubers; stem thickness and branching pattern; leaf shape, size, pinnation, succulence, indumentum; inflorescence size and branching pattern, to list a few. It has been written about elsewhere , but the unfortunate issue with otidias is that many vegetative characters, for which they are so admired, are changed or even lost in cultivation, particularly in greenhouse culture. This makes identification difficult, especially if a specimen in the wild is to be identified on the basis of a species description that was based on a cultivated plant, or vice versa. Looks were deceitful in the court of Henry VIII, and otidias are masters of disguise. Let’s explore the example of Pelargonium laxum ssp. karooicum M. Becker & F. Albers: the diagnosis of the subspecies  is provided in the form of a comparison with laxum ssp. laxum (Sweet) G. Don. 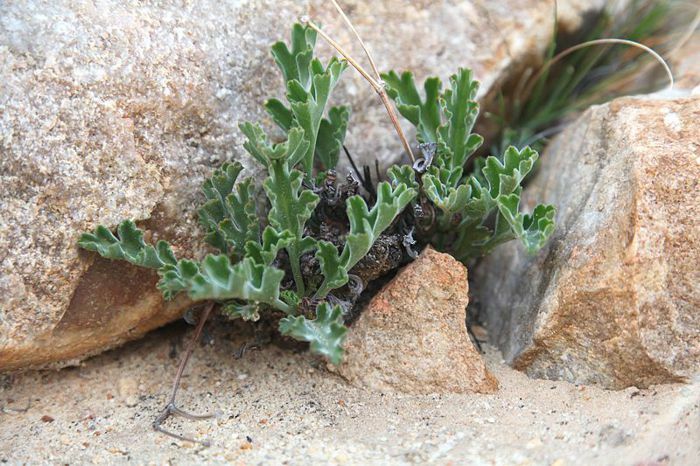 It has tubers, stems of 7-8 mm diameter, branched at base and at apices, succulent leaves with “narrow-banded leaflets” (which could be assumed, looking at the photograph, to mean narrow lobes or pinnae), with margins that are less toothed than in laxum ssp. laxum, and are red coloured. The pedicels are also shorter, the petals narrower, and are curved to a higher degree than in laxum ssp. laxum. The petals are snow-white in colour. The distribution is Klein Karoo, and a photograph is provided of a plant growing close to Oudtshoorn. Let us first take a closer look at a taxon that has been collected several times, and has been in cultivation much before its formal description. Some of these historic collections have been explored in considerable detail by D. Victor , and further information is provided elsewhere . Photos of plants grown in Scandinavia  show thin and sometimes decumbent stems, lobed (but not pinnate) succulent leaves without red colouration in the margins, long pedicels and white petals. So, what would this taxon have looked like in nature? During a visit to the Anysberg Nature Reserve and the rest of the valley extending east-west alongside the mountain range in 2016, I took a few days to admire the quartz fields in the western part of the Reserve, replete with small mounds of mesembs as well as miniature Monsonia camdeboense, and hiked through the wilderness to see the views from the top of the mountain range, marvelling at the rapid transition from succulent karoo vegetation to fynbos towards the top of the range. Somewhere in this transition I found exceptional specimens of Pelargonium alternans ssp. longicalcar, and numerous other interesting pelargoniums, including hoareas not yet described from this part of the Karoo. Fig. 1: A well-grazed P. laxum ssp. karooicum growing among pebbles in the sandy valley to the north of the Anysberg range. Invariably, the otidias of interest grew in the sandy soil among large pebbles left by a stream once meandering through the valley (Fig. 1). The bottom of the valley does not have dense vegetation, though the plants do receive some shading from the stones. The plants grow in significant numbers, with stems grazed at tips, leading to repeated branching. These resulted in quite small plants, only up to 15 cm tall. As this was August, most of the plants were in bud. 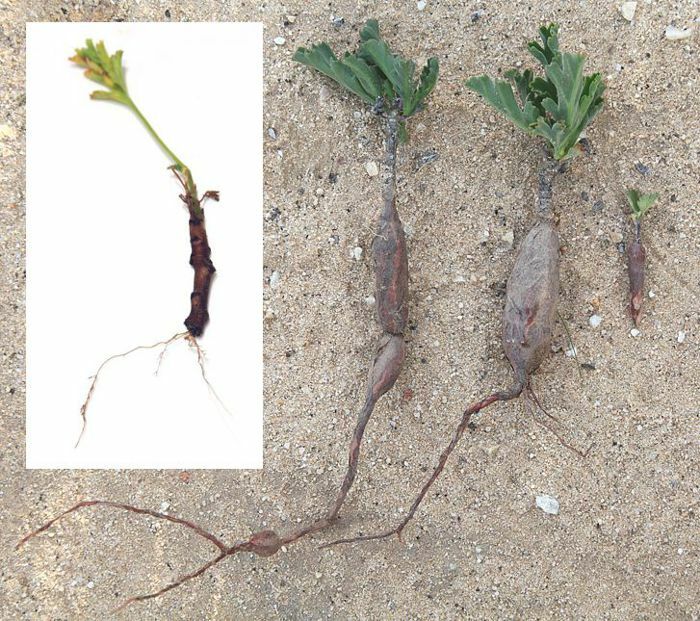 Outside the reserve, alongside the road, a few plants were dug up (and then planted back) to examine the root system and it was not a surprise to see elongated vertical tubers, as well as small round tubers connected by thin roots (Fig. 2). The leaves were succulent, some had red margins, the pedicels were short, the petals white and recurved twice (i.e. S-shaped, Fig. 3). In all the characters except pinnation, these exactly matched Becker’s description of P. laxum ssp. karooicum, therefore. Fig. 2: A few plants dug up to reveal the tuberous roots (the specimens were re-planted). Insert: a rooted cutting without tubers. However, there should be no hesitation to assign the Anysberg taxon to P. laxum ssp. karooicum just on the basis of leaf shape. Namely, the sizes and shapes of otidia leaves vary considerably in nature. For example, those of P. carnosum ssp. carnosum that I have seen varied from 5 cm in length on the exposed hilltops close to Cape Town, to the massive 30-cm bipinnatifid leaves growing beneath larger shrubs in the fertile Olifants River valley. A couple of cuttings of Anysberg plants were rooted in part shade in a greenhouse in London, UK. It was not a surprise that the roots were fibrous, and the leaves large, less succulent and that no red was observed in the leaf margins. The cuttings flowered and produced umbels with extremely long pedicels (Fig. 3). In other words, in a year’s time the plants transformed into P. onustifolium. Fig. 3: P. laxum ssp. karooicum flowering in the greenhouse, exhibiting extremely long pedicels in comparison with the same species flowering in nature (insert). Fig. 4: P. laxum ssp. karooicum, east of Oudtshoorn. In contrast to the plant illustrated in , these grow in the shade of grasses, exhibiting less compact growth. Credit: Judd Kirkel Welwitsch, reproduced with kind permission of the author. On the other hand, the photograph of P. laxum ssp. karooicum in Becker and Albers’s publication  is of a plant from close to Oudtshoorn, about 160 km east of Anysberg. A few observations of this population are available in iSpot [7,8], showing what appear to be large lobed leaves, some with red margins, petals pure white, but neither as narrow nor of the S-shape that would be considered typical for ssp. karooicum. 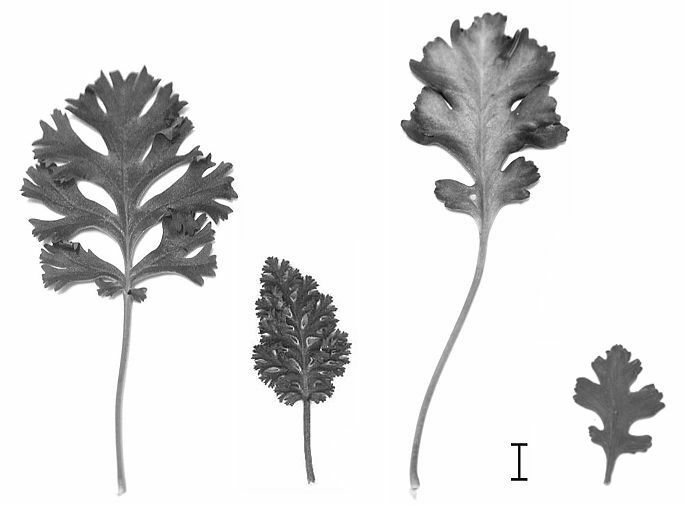 Interestingly, the pedicel length is not as short as that of the field-grown Anysberg taxon (Fig. 4), so this character should not be used to separate ssp. laxum from ssp. karooicum, as it is evidently quite plastic. The apparently typical red leaf margin perhaps requires a bit more attention. Not all plants seen in nature had such margins, and sometimes, only some leaves had reddish margins on the same plant. Given that natural red colouration can be lost in cultivation, it could be a sign of environmental stress. 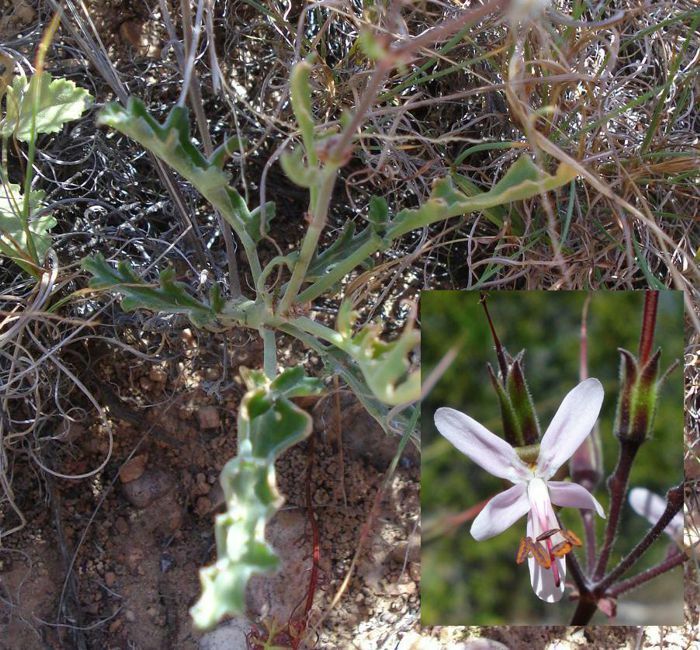 Some taxa in the section Otidia may be more prone to it (I have seen very red sun-baked specimens of P. parviflorum near Loeriesfontein in the drought of 2017), but depending on the habitat or cultivation conditions, this character may be absent and should be regarded as unreliable. It has further been suggested to raise P. laxum ssp. karooicum to specific rank and the name P. karooense R. Clifton  was proposed, in order to deal with the problem that P. karooicum is already a valid name for another species. Becker et al. argue that “Field studies and herbarium sheets have shown that there are several phenotypes of P. laxum s.l. that agree in flower syndrome but differ in stem and leaf characters. Two of these phenotypes, which only distinguish [sic] slightly, are given the status of subspecies […]”. The cladogram based on DNA markers that they present shows that ssp. laxum and ssp. karooicum are indeed closer than P. laxum is to P. keeromsbergense, so the choice of subspecies rank could be justified. From the morphological point of view, it might well be useful to also suggest for P. keeromsbergense to be treated at subspecies level, so that all the otidias with sharply reflexed petals and downward-facing buds are treated under one taxon, however, this could equally be dealt with by establishing a Laxum group of sect. Otidia. For the sake of nomenclatural stability, as promoted by the ICBN, the status quo might be retained and the new name for ssp. karooicum avoided. However, the reason for raising ssp. karooicum to species rank that has been put forward  is “[…] at least until the problem of the taxon currently known as “P. laxum” in horticulture can be decided […]”. This appears to be based on the belief that Sweet’s illustration (the iconotype ) and P. laxum ssp. laxum  represent different taxa. However, do they? Is it possible to grow P. laxum ssp. laxum  to look like Sweet’s Otidia laxa, in the same way as it is possible to grow P. laxum ssp. karooicum to look like P. onustifolium? To answer this question, let’s first examine a few other illustrations in Sweet’s Geraniaceae to infer what the cultivation conditions might have been then and whether in addition, the artist took some artistic freedom. In Fig. 5, four otidia illustrations are reproduced. As far as we know, all of Sweet’s illustrations in this series were done by one artist: Edwin Dalton Smith. Smith was a Kew artist and very widely respected in his time and since. One might think that he was an expert at recognising detail from the fact that he was also a well-respected miniaturist. Looking at the illustration of O. carnosa, all of the flowers have short, non-fertile stamens, which often occurs in insufficiently lit greenhouse conditions (cf. Fig. 3). Yet, O. carnosa and O. alternans are at least easily recognizable. There is some artistic freedom in the illustration of O. alternans, where stipules seem to be randomly distributed – stems of this taxon are naturally covered in remains of petioles as well as stipules, and sometimes peeling bark. On the other hand, the depiction of O. crithmifolia looks significantly different to the naturally grown plants adorned with crowns of thorny remains of peduncles we see from Touwsrivier to the depths of the Richtersveld. It is may be difficult to achieve the same compact inflorescence shapes in greenhouse conditions. The shape of the inflorescence in Sweet’s illustration does not resemble that of P. crithmifolium, and neither do the flowers resemble those of the species. Good luck to anyone trying to find this taxon (or Dürer’s Rhino ) in nature! Perhaps Sweet wasn’t too interested in details, he was a nurseryman after all (interested in selling plants), but this is certainly a case where the artist has depicted a plant that grew in low light conditions, depicted a hybrid, or has taken too much artistic freedom – or all of three. Could this be the case with the iconotype  reproduced in Geraniaceae Group Associated Notes No. 81, p. 20 as well? Is it possible to grow a leaf of P. laxum ssp. laxum to resemble that of Sweet’s illustration? Fig. 5: Sweet’s otidias. A: Otidia carnosa t. 98, vol. I; B: Otidia laxa t. 196, vol. II; C: Otidia alternans t. 286, vol. III; D: Otidia crithmifolia t. 354, vol. IV. Fig. 6: Leaf variability in P. laxum. From left to right: ssp. laxum (cultivated), ssp. laxum (natural), ssp. karooicum (cultivated), ssp. karooicum (natural). A cutting of P. laxum ssp. laxum from the vicinity of Graaf Reinet  grown in low light conditions in a greenhouse in London, UK, during the winter of 2017/18 developed leaves that lost the very fine indumentum on their margins (which makes the margins appear white), along with more pronounced pinnation (Fig. 6). True, not quite to the level of Sweet’s illustration of Otidia laxa (Fig. 5, B) but it is at least possible that Sweet’s illustration is actually that of a P. laxum ssp. laxum as we know it today . Certainly, Sweet’s plant could also have been a specimen of what we now know as P. keeromsbergense  (geographically more accessible to early explorers): the posterior petals in the illustration appear rather short, and the leaves are large and bipinnatifid. As pointed out , we do not know the provenance of the plant in Sweet’s illustration and given that the iconotype could represent P. laxum ssp. laxum , P. keeromsbergense , or another (hybrid) taxon still, P. Vorster had two choices when referring to Sweet in his seminal work on the section Otidia in 1990 : either declare Sweet’s iconotype as insufficiently known and invent a new epithet for P. laxum, or use the name the way he did. Given the uncertainties surrounding Sweet’s work, we gain nothing by re-interpreting Sweet, and nomenclatural stability should be promoted. Thus, it appears that we have come full circle in a few greenhouse experiments and with some fieldwork. The Anysberg P. laxum ssp. karooicum was grown to look like P. onustifolium making the latter name (as well as P. karooense) redundant. P. laxum ssp. laxum was grown to resemble Sweet’s Otidia laxa, confirming the possibility that the two are the same taxon. This still leaves us with further recent taxa that have been described on the basis of what could be considered minor variations in one or two characters, and that might better be described as cultivars: P. opinatum R. Clifton , and P. opiparum R. Clifton  apparently differ from P. laxum ssp. laxum on the basis of, respectively, “highly reflexed upper petals, the leaves with continuous lamina […], lobes with blunt, almost square teeth […]”; and “leaves not pinnate but pinnatifid, or a few lowest lobes free […], the lobes wider at tips and there sharply & finely toothed, usually with one longer sharp tooth at the base of each lobe […].” Further details of inflorescence branching patterns are apparently typical for P. opiparum, though these appear to be within the range observed for P. laxum ssp. laxum. Given the variability of leaves in nature and in cultivation, P. opinatum and P. opiparum should be considered as synonymous with P. laxum ssp. laxum. To finish, a known unknown: P. orientum R. Clifton  is based on the illustration of a specimen from Klipplaat (85 km S of Graaf Reinet) in Flowering Plants of Africa . Additionally, a herbarium specimen at Kew, collected at De Rust (K000276042) and a further voucher specimen at Kew are quoted (not seen). Becker and Albers considered the Klipplaat taxon to exhibit a mix of P. laxum and P. parviflorum characters : the illustration shows thick stems, leaves up to 18-cm long, bipinnatipartite, segments channelled with minutely ciliate margins, petals creamy-white, buds and stamens downward-facing. They indicate the existence of further assumed hybrids from around Jansenville (20 km E of Klipplaat) . The hypothesis that Dyer’s P. laxum (and, by extension, P. orientum) is a natural hybrid thus still needs to be explored. The variability of Otidia section taxa requires caution: due to the plasticity of some morphological features, greenhouse-grown plants may exhibit characters that are unknown in nature and describing a species only on the basis of a (historic) illustration or a cultivated plant has led to confusion and should be avoided. If naming of cultivated forms is required, more use should be made of cultivar names. Separation of P. laxum ssp. laxum (Sweet) G. Don and P. laxum ssp. karooicum M. Becker & F. Albers on the basis of red colouration of leaf margins and pedicel length is not possible, as these characters do not appear to be stable and thus distinct. It is proposed that we keep the name P. laxum ssp. laxum (Sweet) G. Don in the interest of nomenclatural stability as it is possible that Sweet illustrated this taxon. The name P. karooense R. Clifton is redundant and P. onustifolium R. Clifton is synonymous with P. laxum ssp. karooicum. P. opinatum R. Clifton and P. opiparum R. Clifton are synonymous with P. laxum ssp. laxum (Sweet) G. Don. P. orientum R. Clifton may require some more fieldwork and cultivation experiments, and the hypothesis that it is a natural hybrid of P. parviflorum Wendl. and P. laxum ssp. laxum (Sweet) G. Don should be tested. I am grateful to Judd Kirkel Welwitsch for the permission to use his photographic material, and to Florent Grenier for his comments on the manuscript. David Victor decisively contributed to some of the ideas that shaped this manuscript, and patiently provided editorial support, and significant and sincere thanks go to him. Strlič M. (2016), Otidias, or the Story of Dürer’s Rhino. Pelargonium Notes, #4. Victor D. (2014), Pelargoniums that are not P. hermansdorpense. Geraniaceae Group Forum. 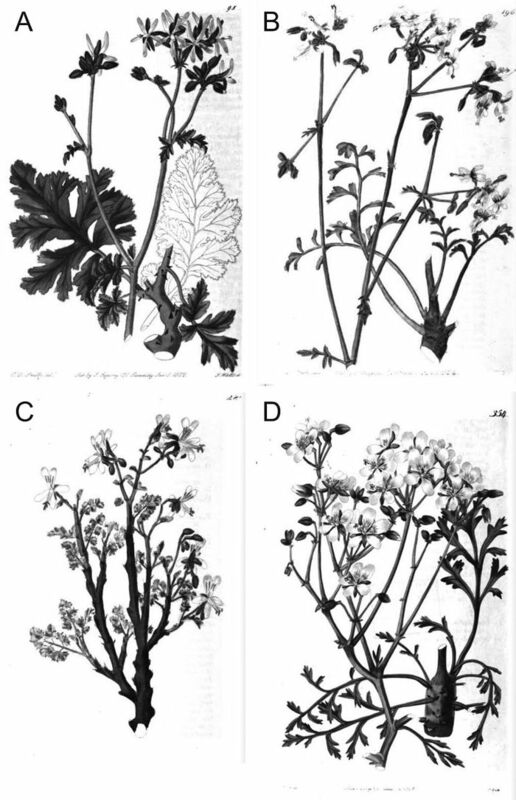 Clifton R. (2015), Pelargonium karooescens (from P. laxum auct. subsp. karooicum). Geraniaceae Group Associated Notes No. 81, p. 17. Adolfsson Mann V. (2012), A Pelargonium Species Exhibition In Sweden. Clifton R. (2015), Pelargonium onustifolium (from P. ‘Humansdorpense’ Hort.). Geraniaceae Group Associated Notes No. 81, p. 28. Clifton R. (2014), P. laxum of Albers, Schaper & Becker. Geraniaceae Group News No. 132, p. 40. Sweet R. (1824), Otidia laxa, t. 196. In: Sweet R.: Geraniaceae, Vol. II, London, 1822-1824. Clifton R. (2015), Pelargonium laxum. Geraniaceae Group Associated Notes No. 81, p. 7. Vorster P. Proceedings of the International Geraniaceae Symposium, Stellenbosch, 24-26 Sep 1990. Clifton R. (2015), Pelargonium opinatum. Geraniaceae Group Associated Notes No. 81, p. 32. Clifton R. (2015), Pelargonium opiparum. Geraniaceae Group Associated Notes No. 81, p. 34. Clifton R. (2015), Pelargonium orientum. Geraniaceae Group Associated Notes No. 81, p. 36. Dyer R.A. (1953), Pelargonium carnosum. The Flowering Plants of Africa 29, t. 1145. This article was first published in Geraniaceae Group News #150. Cite as: M. Strlič: The Laxum Conundrum. Geraniaceae Group News #150, pp 15-24. Category: Cultivation, Field notes, Taxonomy.